Taoyuan, Taiwan, 10th October 2015 – Santana Chapman (17) of the Coastal Wanderers Swimming Squad, Kapiti Coast, has won two Bronze Medals in the 50m and 200m Breaststroke at the 8th Asia Pacific Deaf Games in Taoyuan, Taiwan. These are New Zealand’s first ever medals at the Asia Pacific Deaf Games, which has attracted 1,500 athletes from 22 countries. Santana also recorded three new personal best times; 0.55 seconds off her 50m Breaststroke time to record 40.45, 0.90 seconds off her 100m Breaststroke to record 1:31.74, and 2.20 seconds off her 200m Breaststroke time to record 3:17.32. The 8th Asia Pacific Deaf Games is Santana’s second international swimming meet, the first being the 22nd Summer Deaflympics in Sofia, Bulgaria in 2013. She now has her sights set on the 2017 Summer Deaflympics in Samsun, Turkey. Daniel Harborne, Deaf Sports New Zealand President, is looking forward to sending a strong New Zealand team to the Deaflympics. “We are excited to see Santana compete again at the 2017 Deaflympics in Turkey. We hope to have another successful New Zealand team, and bring home more medals”. Costs: Costs vary as it depends on where you wish to be seated. Look at website for selection of seats. 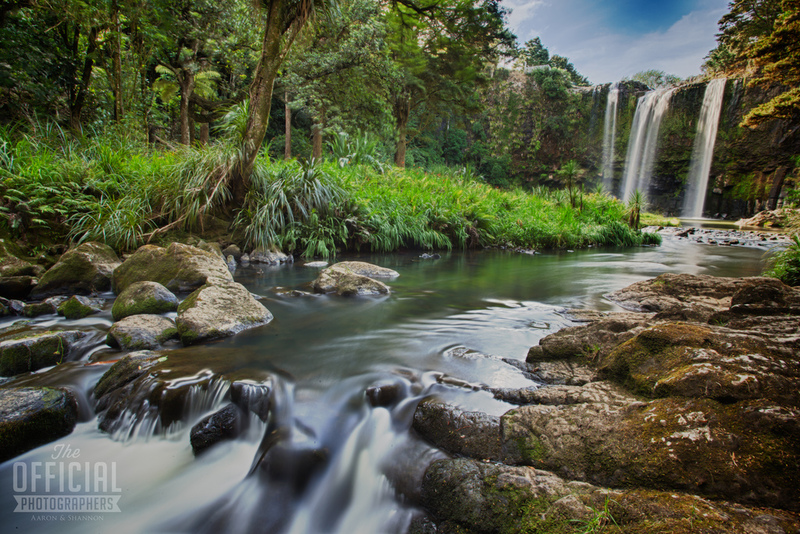 This walk travels from the Town Basin along the Hatea River in the Whangarei CBD to the gorgeous Whangarei Falls. It will take you approximately three hours one way – the perfect amount of time to immerse yourself in this beautiful environment. You can start at either end, with parking available at both. If you start at the Whangarei Falls end, you will be travelling mostly, gently downhill. You also have the option of doing parts of the track, with parking, and entries and exits available at multiple points. Always remember to pack a bottle of water, and some lunch. Wear sturdy shoes, and suitable clothing. 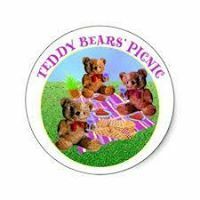 Collectables of all kinds, old and new - books, china, glassware, model cars, pictures, old toys, Disney figurines, LP records, garden art, retro clothing. etc, anything people like to collect. 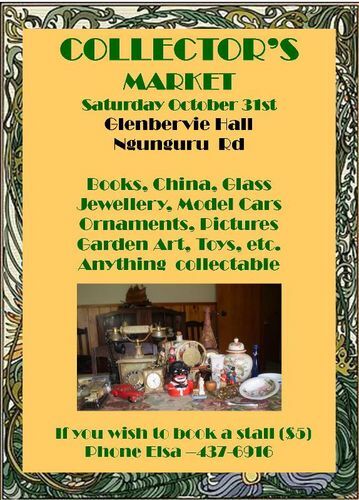 If you have something you would like to sell bring it along - stalls available only $5. If you want to add to your collection, come along, you never know what you may find. Or just come to browse and have a coffee. To book a stall contact Elsa. 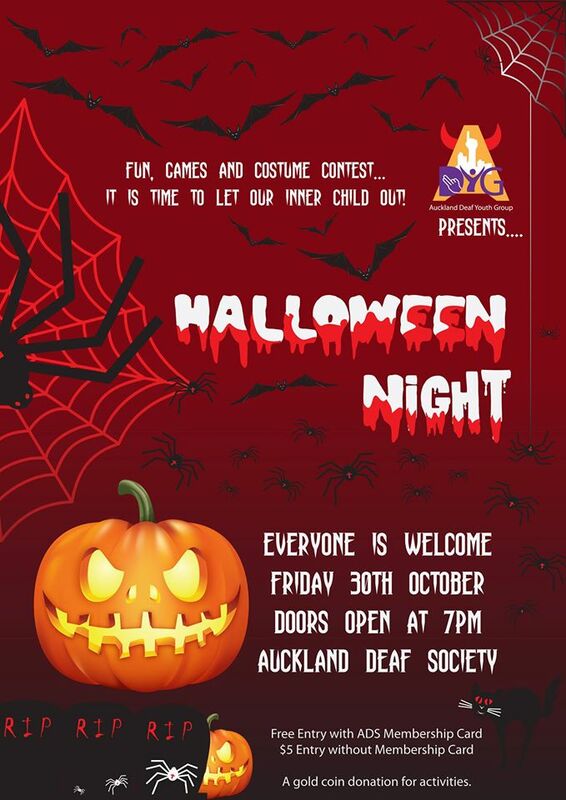 Halloween Night is on at Auckland Deaf Society! Dress up in your scariest costume! A make-up artist will be there to apply all the gory details… Those who come best dressed win a prize! Costs: Non Members $5, Members free. Along the way, we taste local artisan produce, baker’s delights, a taste of the orient and much more. On the 6th November at 7:00pm, there will be a special general meeting for all members. The purpose of the meeting is to change the balance date of the audited accounts from November 30 to March 31st. This involves changing our constitution. Why change the balance date? Our accountants and finance staff recommended we have the same balance date for ‘Auckland Deaf Society Incorporated’, ‘Auckland Deaf Society Foundation Trust’ and ‘Potters Park Events Centre’. One of the benefits of changing the balance date is that we will be able to produced consolidated accounts giving you a more accurate picture of the financial health of the organisation. I do hope you will make every effort to attend this short meeting. At 7:30pm – 8:30pm on the 6th November, we will have a community meeting. 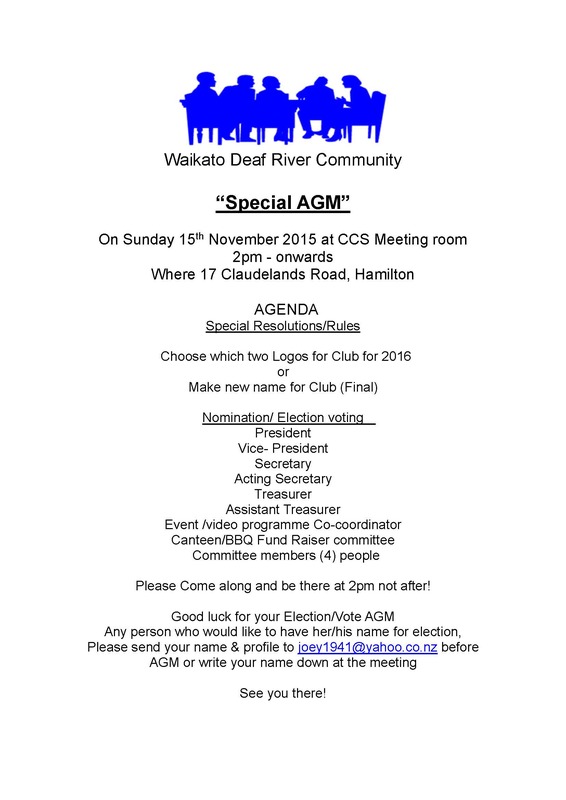 The purpose of this meeting is to outline the draft 2016 – 2019 strategic plan of Auckland Deaf Society. This will be a brief presentation. We want you to help us shape the strategic plan for your society. 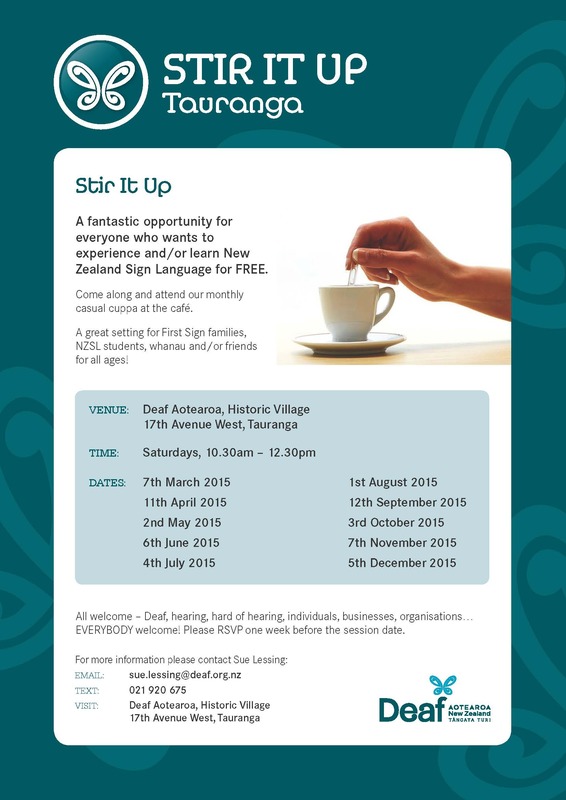 You can do this by bringing your ideas, priorities and vision for the future of the Auckland Deaf Society. There will be many different ways to make suggestions including NZSL video, vision boards, suggestion box, talking to staff and board. Please come along and share your ideas. A great opportunity for your families and friends to get out and have fun! 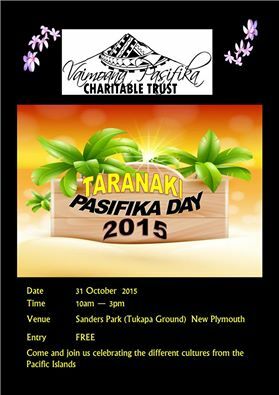 There are some events around South Auckland. Have a look around at these websites for some ideas for your family and friends to get together. Next month will be last one for this year 2015. 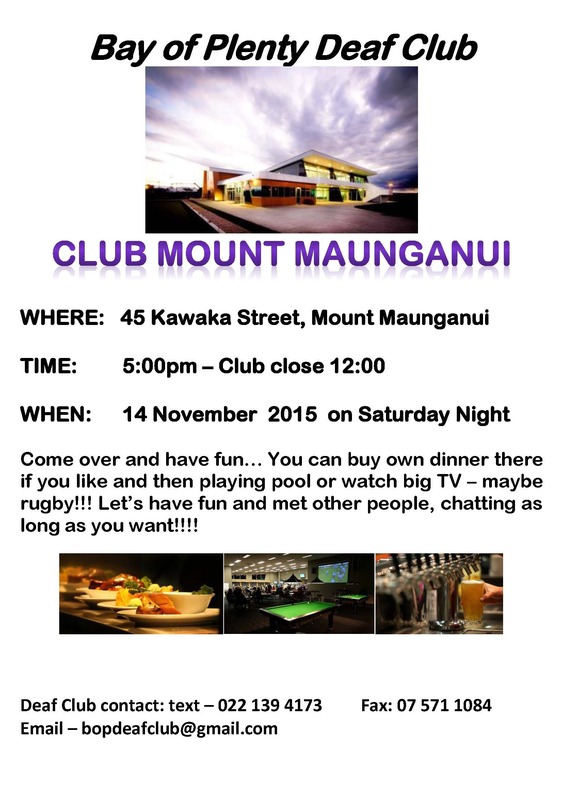 So come along South Auckland Deaf Club. This event is suitable for all ages. Everyone must bring any canned Wattie’s food to the movies at the Manukau Westfield mall for free movie tickets! This is for the Salvation Army who will be helping many children at Christmas. A great opportunity for your family and friends to have an awesome night out. Click the links and see all the information about movies and more information in there. 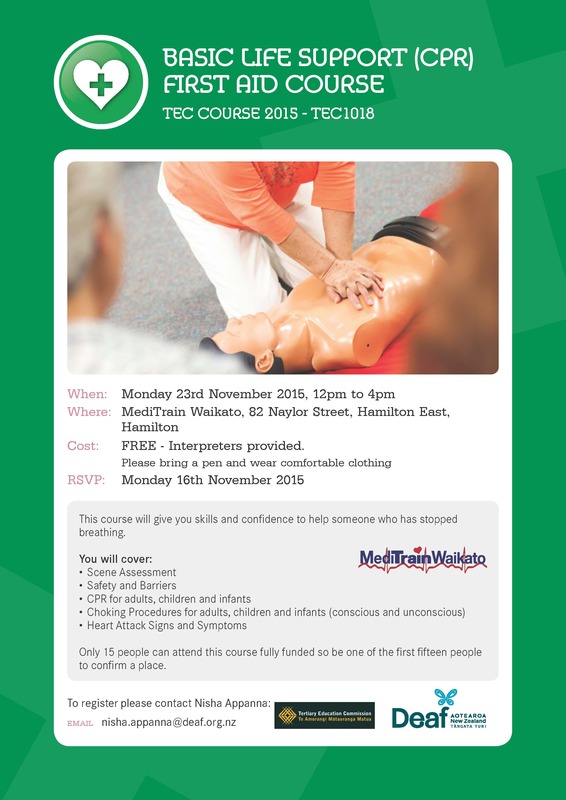 Gain the skills and confidence to help someone who has stopped breathing. CPR for babies, children, and adults. NZQA accredited, 4 hour course. Don’t forget your Deaf Card. 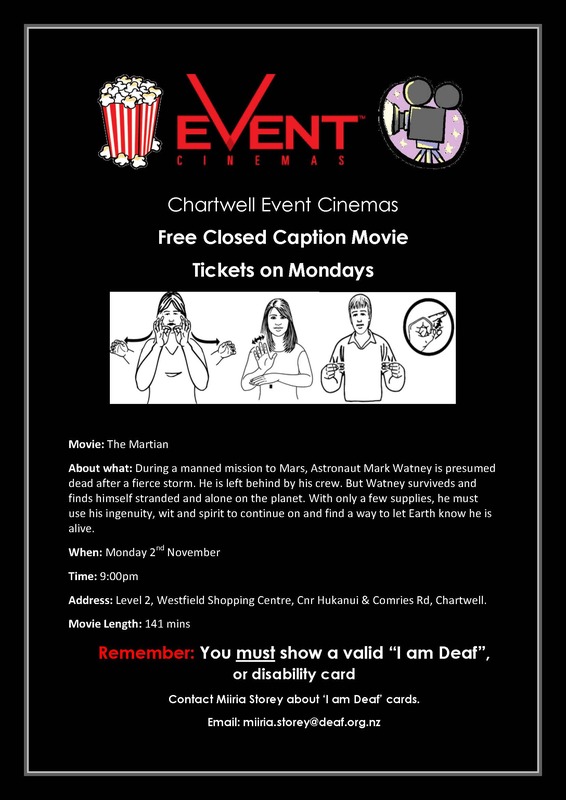 If you forget your Deaf Card then movie isn’t free. 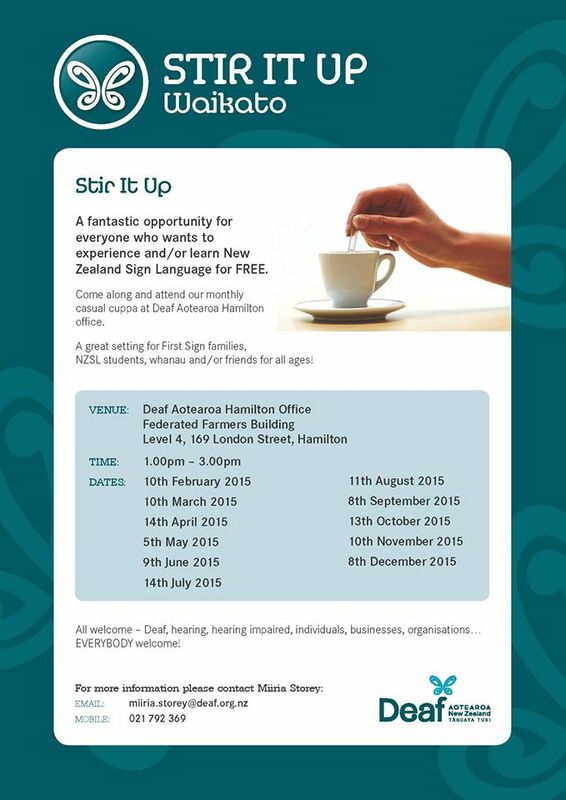 If you don’t have a Deaf Card please contact Deaf Aotearoa Hamilton Office and we can help. For Stir It Up in November we will be showing all the great short films from the Deaf Film Festival held in Wellington this year. Come along and see their great work, eat some popcorn, and meet some people. We would love to have you there! And it’s Free! Please Contact Nisha Appanna to let us know you are coming along. Please send your name & profile to joey1941@yahoo.co.nz before AGM or write your name down at the meeting. 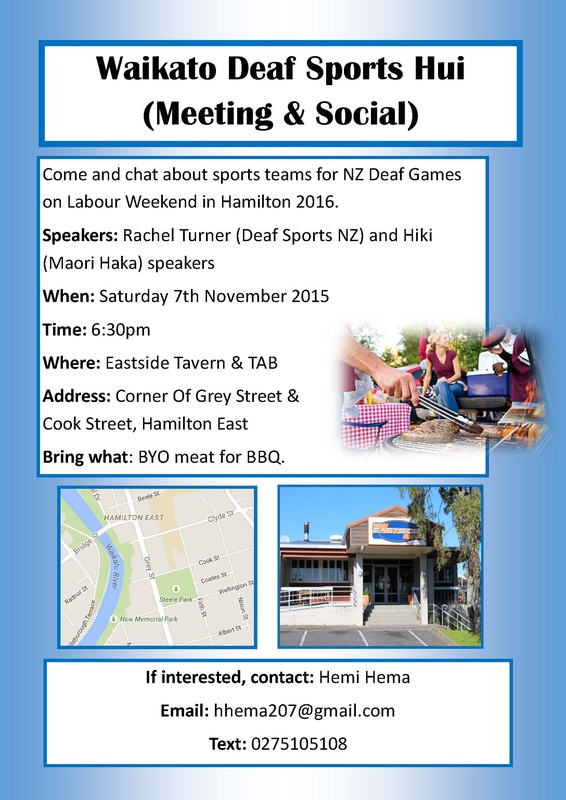 What: Come and chat about NZ Deaf Games on Labour Weekend in Hamilton 2016. If interested, contact Hemi Hema. Tea/Coffee provided. Bring a plate of something small to share if you wish. This gathering is for anyone of all ages to attend to have fun learning and/ or practising NZSL. Click on flyer for more information and contact details. This is a time to get together, have a game of pool, watch sports on big screen, catch up with friends and more. Quarry Fest is held in November each year and there will be craft and food stalls and entertainment in the amphitheatre. 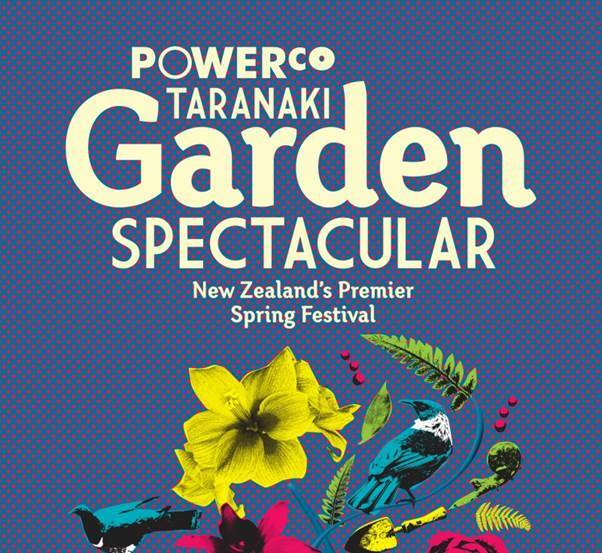 For the annual Powerco Taranaki Garden Spectacular 47 of the region's most glorious gardens open their gates to visitors. Along with these natural beauties are a bunch of inspiring events, many about nurturing the environment. Cultural entertainment, food stalls, sports, crafts and loads of fun! 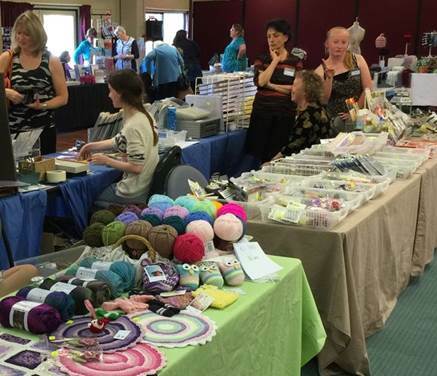 Local Handcrafts Taranaki Inc are holding their annual Craft and Hobby Fair. We are inviting any person who would like to display their hobbies to contact us about having a stall at our fair. 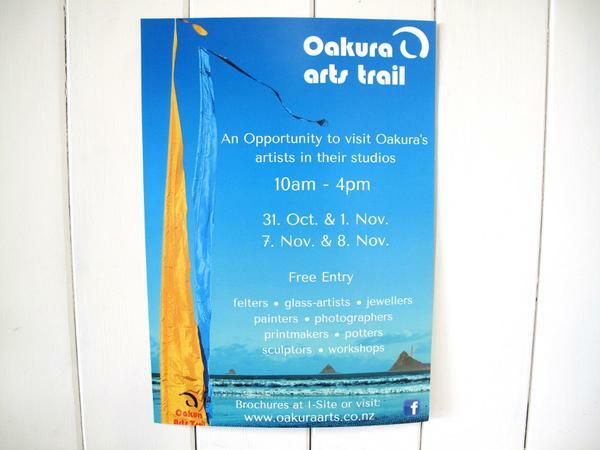 A chance to visit their talented artists in their studios around Oakura. Enjoy the inside of every individual workspace and get the chance to meet the artists behind the art. Brochures including maps are available at the New Plymouth i-Site and online. Large turquoise and yellow Bali flags will guide you to the studios during the event over two weekends. Enjoy great art in Taranaki! Jodi Roebuck has a large bio-intensive garden focused on seed production, a flock of sheep and deep-rooted knowledge in gardening which he shares through workshops and as a consultant. 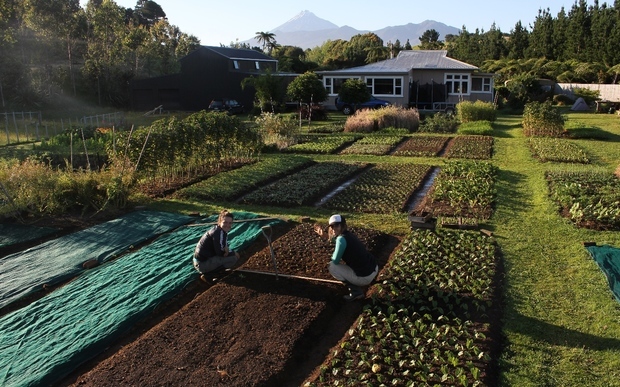 Join him at his Omata farmlet where he will be focused on "season extension", which will include greenhouse production, plus bio-intensive seedling raising and transplanting. Polaris NZ presents the ENZED Offroad National Championship finals which are a two day event. Track is located Crownthorpe off Napier - Taihape Road. Saturday is short course racing: there will be over 20 class races held on this day, plus two all-in feature races, between 10:30am - 3:00pm. Sunday is an Enduro event where an expected 50+ cars and trucks compete together in a single 200km-250km race. The Enduro track will be across 250 hectares of rolling farm at the same venue, track length will be approx. 13km. Races are by class ranging from buggies, trucks, and mini Kiwitrucks raced by children up to the age of 15. This event is going to be the greatest offroad racing event this year, the short course track has excellent features for both spectator and driver, with natural terrain, jumps, drop-offs and fast flat and cambered sections. The enduro track has excellent views for both spectator and driver, and most of the enduro track can be seen from the one vantage point. Hot Food and drinks available, an excellent family day out. Bring your pooch along for a fun day out for the whole family. This event celebrates the joy of pet ownership and will provide education and information on all aspects of pet care. The talents of local craftspeople and artists will be a feature at the market offering a great pre-Christmas opportunity to purchase their work and licensed food stall holders will provide nourishment and energy for the Doggy Games, dog agility displays and events that will also be happening. Fun day for all! Come and bring your teddy's free registration. Lots of stalls entertainment mahons rides pony rides and much more. There will be no tickets sold after 9:00pm. This will be a catered dinner and prize giving for MDS Sports Person of the Year and Stirrer of the Year. Come and join and have some fun. There will be no tickets sold after 9:00pm. Come join them for dinner and social prize giving. This is the third café opened by the owner of CO-ED and Little Café is called Three Café in Taita. They are located on Taine Street in Walter Nash Centre. Feel free to stop by and check the place out! Bring your family and friends over! You can also check their Facebook page and website for more details. The gathering will be at the Supply room in Paremata. Where: 105 Mana Esplande in Paremata. Come out and have a chat and have a few laughs! Come along and socialise with the Deaf community, all welcome. Where: Kaiteriteri Beach. Meet at the carpark. Bring your own lunch, drinks and use the BBQ if you want to. If it’s raining it will be cancelled. Please let Rachel know if you need transport. There will be some fun cooperative games, followed by lunch and then down to the beach to build creative sand sculptures. 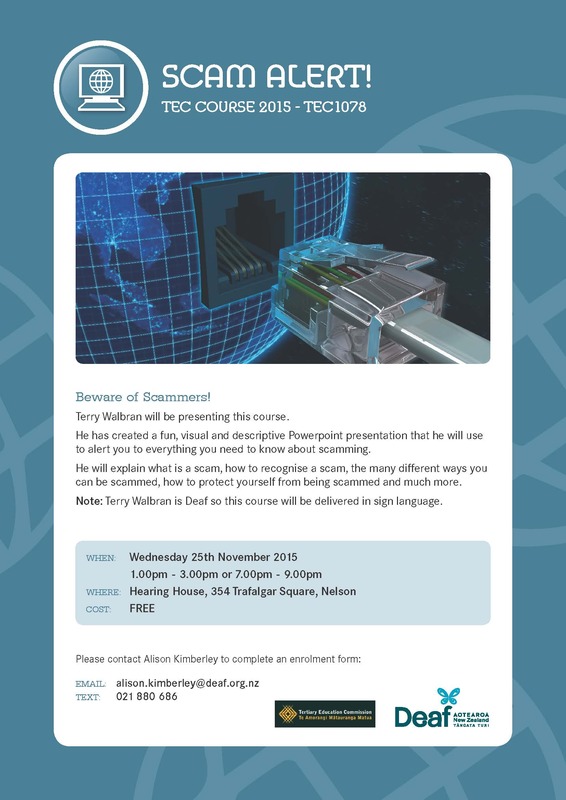 Terry Walbran will be presenting this course. Time: 1:00pm – 3:00pm or 7:00pm – 9:00pm. Contact Alison Kimberley if you would like to enrol. This will be a great day for the whole family to meet others in the Deaf Community. Sausages and drinks will be provided for everyone or free to bring your own food, drink and sunscreen. We would appreciate a gold coin donation to help cover costs. Parents please bring a present under $5 for Father Christmas to give your child. Please specify how many children/adults and if you need transport. Avoid the hassle of driving to and parking at this popular event by taking the Red Bus. 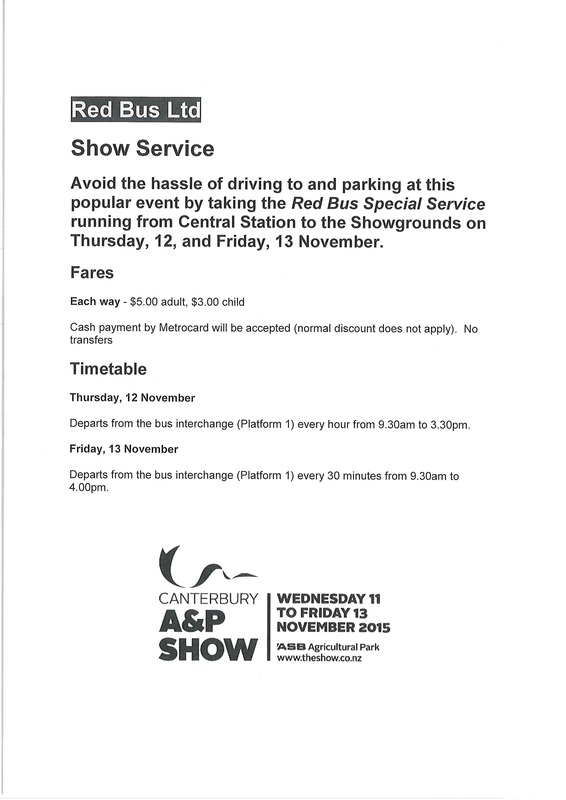 A special service running from Central Station to the Showgrounds on Thursday 12th and Friday 13th November. Depart from the bus interchange (platform 1) every hour from 9:30pm. Depart from the bus interchange (Platform 1) every 30 minutes from 9:30am to 4:00pm. It’s an xciting time this weekend! The Rugby World Cup final will be on this Sunday! The Southern zone Deaf rugby Union is going to host hot breakfast at Deaf Society of Canterbury. Door opens after 4am at Deaf society of Canterbury. Cost: $10 per person for breakfast. Free entry to watch the game. Please contact the Southern Zone Deaf Rugby if you keen for breakfast. A fun filled evening at the Deaf Centre! Pot luck dinner and fancy dress. Bring a plate for shared dinner. Come along to Stir it Up! 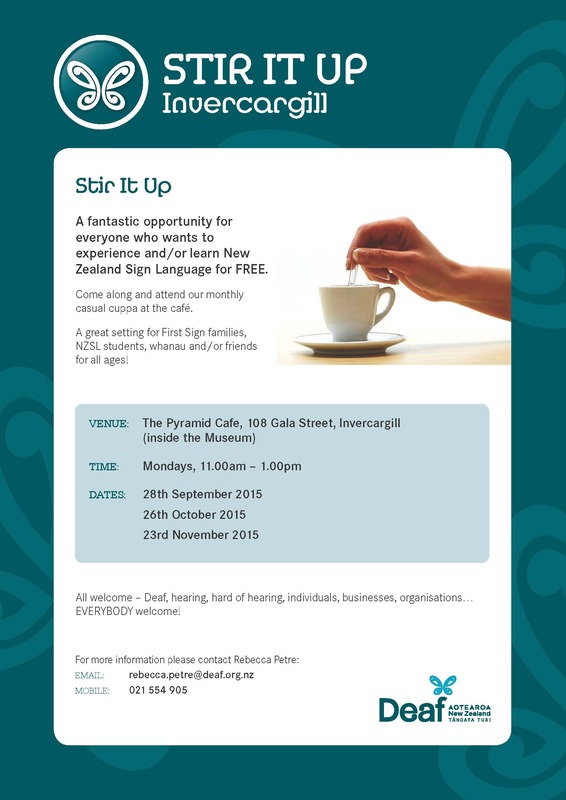 This is a monthly event for the public to come along and experience and learn New Zealand Sign Language. Come along to enjoy a monthly casual cuppa at the Excelsior Café. All Welcome – Deaf, hard of hearing, hearing, individuals, businesses, organisations. Please RSVP to Anna one week before session date. Employers will be there to do interviews – bring your CV and appropriate dress. 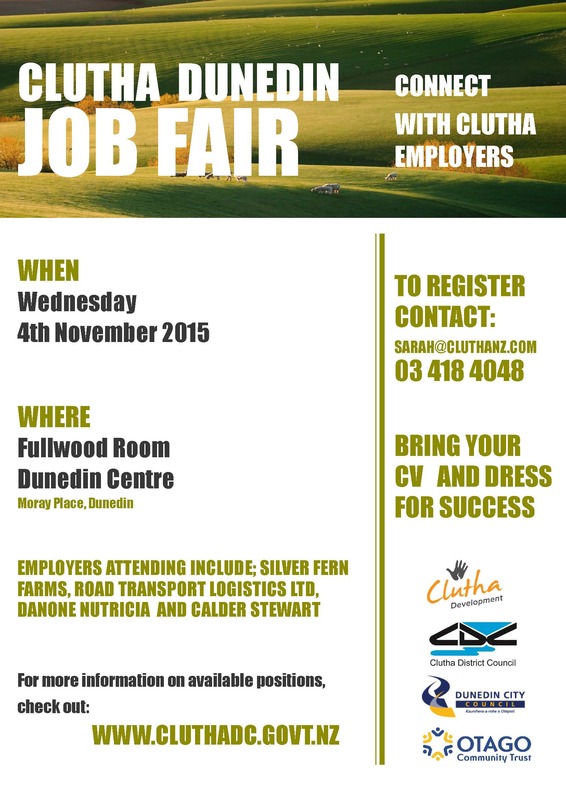 Employers include Silver Fern Farms, Road Transport Logistics, Danone Nutricia and Calder Stewart. 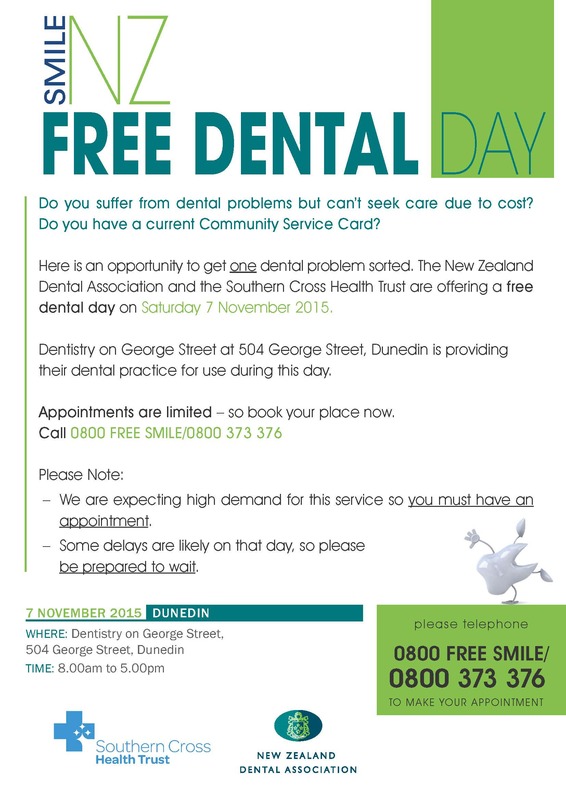 Please contact Dunedin Deaf Aotearoa staff if you have any questions. Do you have dental problems but can’t seek care because of cost? Do you have a community services card? If yes, then make an appointment to get ONE dental problem sorted. How: Use NZ Relay to call 0800 373 376 or contact Anna or Rebecca for support. Thanks to those who came along to Stir It Up this Week, it was another successful Day. Please not coffree, tea, and food etc. is at your own costs. Invercargill’s number one Community Market with over 30+ stalls every month including food, crafts, art, entertainment, free activities and more. Last Saturday of every month. Mark in your calendars, Hope to see you there. Deaf Aotearoa will be on the move soon. The DRC Office is still temporally closed for now, please if you need to see and make arrangements for appointments with Rebecca please contact her.